(CNN) -- The moment I saw that guinea pig's corpse, I made up my mind. I would not tell my son Checkers was dead ... at least not that night. Drew had five tests within the next two days. I wasn't going to let grief jeopardize his grades. 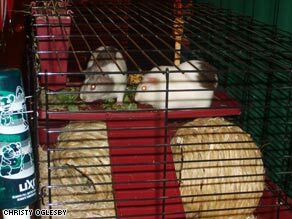 Checkers, on the left, enjoys a bit of kale with Andrea. I realize instantly the challenges of my decision. How could I keep this secret in a 10-by-12 room in which the guinea pig chalet was almost as big as the twin bed? I'd already goofed by yelping, "Oh, my!" when I saw the body. Drew heard me from his bathroom. "What's wrong, Mommy? Are you OK?" "I'm fine," I reply. But he recognizes that I haven't answered both questions. "Well, why did you say that? Is it the guinea pigs?" I feel panicked. No sloshing! He's drying off! Pajamas are next! I realize I'm holding my breath, and in my head, I'm yelling, "Move, Christy! Move!" I exhale as I lie. "Everything's OK."
In what seemed like one move, I reach in the closet, dump shoes out of a box, grab Checkers, plunk the stiff in the box, run downstairs, stuff the cardboard casket into a plastic bag, dash to the garage trash can, finish rapid hand-washing and make it upstairs as my third-grader steps into the hall. "We're having storytime in my bed tonight!" I say breathlessly. My bed is off-limits except for nightmares, illness or Saturday morning. Drew's so excited about the treat, he runs for the king-sized sanctum without asking questions. We read and pray, and then I give him a piggyback ride into his dark bedroom. It's Wednesday, 7:45 p.m., and for now, I'm in the clear. By the time Drew wakes the next morning, I have a plan: darkness and distraction. We're always 30 minutes into our commute before the sun rises. Between a disabled circuit breaker to prevent lights in his room from working, piggyback rides up and down the stairs, dressing in mom's room (where the lights work) while we review potential bonus words, multiplication drills, Scripture recitation for the Bible test, questions science and reading lessons, there are enough morning distractions to safeguard my secret. Thursday evening is a challenge. In our house, TV is for weekends only. It's cold and drizzly outside; Andrew has beaten me in chess -- twice. I pull out the biggest distraction of all. "I'm going to let you see a video tonight. You need to relax a bit from those tests today," I say. His eyebrows make a big V on his forehead. "But it's a school night, Mommy." I assure him it's OK. He's suspicious, but TV is as awesome as getting in Mom's bed, so no more questions. My co-workers split into camps. The Grief Gurus ream me for concealing the death. Andrew loves Checkers. He deserves timely notice of death. I care more about grades than his emotional health. Bad things will happen to Drew at inopportune times in his life, and he has to learn to juggle difficulties. I'm delaying his development. The Practical Posse has opinions, too. That guinea pig still will be dead Friday. Andrew will be just as sad after his tests with fewer consequences than if he's sad before the tests. Make sure you're honest about why you delayed telling him. After school Friday, I break the news. There's a shriek and then loads of tears. I'll never forget the long drawn-out wail, "I loved her like a daughter!" I'm convinced that boy's been reading William Faulkner, because there is way too much drama that follows. We must wear black for three days. The only song we can listen to on the "High School Musical 2" CD is the duet after Gabriella and Troy break up. It's the saddest one. He cancels Happy Meal Friday, because there is nothing happy about this day. I answer the questions. She was on her side at the end of the ramp. Her mouth was open with her two big teeth protruding. No, it didn't look like she suffered. Maybe a lung problem killed her. I think Andrea (the cage mate) will be fine. No, it wasn't your care that killed her. And then finally, "She died Wednesday." Tears stop. Voice strengthens. "Wednesday?!" "Honey, you had a science test. You needed to know your binominal nomenclature. You had a math unit test, a reading test. You had to do your scripture recitation and a Bible test. You see how upset you are now? I couldn't let you go to school and take tests feeling like this." There's a long pause. And then he says the words that make giving piggyback rides on a spine with bad discs and disabling circuit breakers worth it. He stares deeply and says, "Thank you, Mommy." Maybe the Grief Gurus are right. Maybe Drew deserved to know sooner. But he seems fine. I'm certain he'll develop into a man who can handle more than one problem at a time. And Checkers, rest in peace.